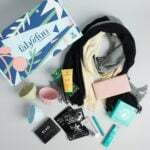 Beauty Box 5 is a subscription box that sends 5 deluxe & full-sized products to your door each month. You receive a mix of products ranging from makeup, hair care, skincare, nail polish, beauty tools, and fragrances. Luxury, drugstore & Indie brands are included. COUPON: Receive a free bonus Marsk Mineral Eyeshadow in your first box! ($24 value). No coupon needed, just subscribe here! Ships to: the lower 48 United States and Canada. Currently unable to ship to AK, HI, APO, and overseas. Check out all of our Beauty Box 5 reviews and our Beauty Subscription Box Directory for more beauty boxes! Each Beauty Box 5 comes with a description card. This month’s theme is Summer Date Night! Before I ever sampled Jersey Shore Cosmetics lip balm, I thought their retail prices were way too high. But after I used the lip balm for the first time I understood. The formula is so smooth and moisturizing. And the tropical flavor is delicious! This pink highlighter is creamy with excellent pigment. (Swatched in lower photo.) You can use this highlighter pencil on your brow bone, corners of your eyes, waterline, etc. I wasn’t expecting much from this little sample, but I ended up being impressed! It’s a rich balm (so it’s a little greasy), and it has a fabulous wintergreen scent. This body scrubber has two sides – so you pick how much exfoliation power you want! Verdict: This month’s Beauty Box 5 has a retail value of about $52. I think that’s great for a $12 box, and I’m so impressed with this box! Almost all full-size items, great value, and good products, too! What do you think about the May Beauty Box 5? FYI – If you sign up for a Beauty Box 5 subscription by the 21st of a month, you’ll get that month’s box as your first box. I’ve been on the fence because of the past 2 boxes, but May is a HUGE improvement…. except for that shadow stick! I really like they include full or deluxe sized samples for $12 or less. This was my first box for Beauty Box 5 & I was so impressed! The jelly pong pong highlighting pencil is THE best cosmetic tool I’ve ever used! It’s amazing! I use it in the inner corner of my eyes,just below my brow bone,to cover any blemishes,& apply to my waterline to brighten the look of my eyes. I truly LOVE it! Also,the jersey shore mongongo lip balm is amazing. I have chronic dry lips & it’s so rare to find a product that really works to hydrate my lips,but this one made a huge difference the very first time I used it. I now am only having to apply balm to my lips maybe twice/day,instead of 5-6 times/day. Very happy with this box! This is never I product I’d buy in a million years, but I’m so glad it was included! I haven’t even opened the other items and I feel like I’ve gotten my money’s worth this month. I was dubious about Beauty Box 5 but each month I was more and more content and curious about what they would send and as time grew they have consistently made me happy. Im surprised because the more popular ones for me have lost their charm while this one is always a pleasant surprise. I just posted in the spoiler post, didn’t notice this review. Love love love! Best beauty box if you compare this box to other similar priced boxes by far! Full size not itty bitty samples. My daughter even did a box opening on her instagram lol. I got that scrubber in another box and just love it! So happy to get another one. That’s Jelly Pong Pong. Mediocre products for inflated prices. My lip color is red. Urg. Love the one you got Liz. I love this box! Now I have been known to wear green eyeliner but the jumbo pencil I received is shockingly grrreeeennn lol seriously! Boxes are my favorite things for so many reasons. They sure improved over the fiascos of the past two months! I was very pleased with the box. A really good value. Liz, did you actually try the Nanacoco eye crayon on your eyelids? Mine broke when I tried it on, and the formula was too oily and messy, unfortunately. The eye crayons from Wet ‘n’ Wild are better quality, in my opinion. You can always write in and ask for a replacement!